Are you looking for something different to do this Fall? 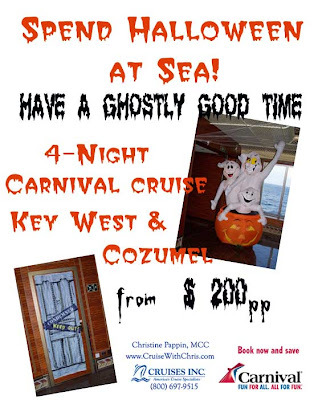 Why not Spend Halloween at Sea? Have a ghostly good time on a Carnival Cruise Line Ship. As you can see in the picture above, the ships are decorated for the holiday. You can enjoy special costume contests for adults and kids as well as trick or treating around the ship during your cruise. Now is the time to book your Fall and Winter get-a-way cruise vacations. Carnival Cruise Line offers their Early Saver Rates when you book in advance. Learn more about these money-saving rates. The small 8,000 inhabitant coastal town of Rockland, Maine and cruise industry giant Royal Caribbean International had been at odds on a "head tax" increase that the town's City Council had put into effect. Last week, the City Council reversed a decision to raise the per-passenger fees for cruise ships 600%, from $1 to $6. 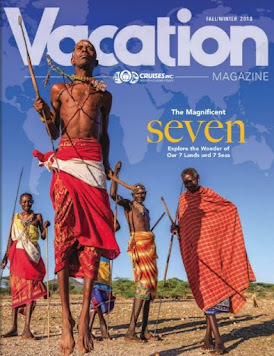 We brought you the original story as part of our article, Cruise Passengers There's a Price on Your Head. Royal Caribbean objected to the increase because it had planned the port visit well, in advance and had budgeted based on the $1 per passenger fee. The City Council was trying to limit cruise ship calls because they had feared negative impact of thousands of people descending on the town. They now admit that their decisions were based on misinformation in the media about the cruise industry's environmental record and crime. Shari Closter, the interim executive director of the Penobscot Bay Regional Chamber of Commerce, which has its office in Rockland, said "there was a large amount of what she called misinformation about the cruise industry out there. Perhaps more damaging, in some cases there was no information at all". Closter has been providing the town's City Council with cruise industry information and also informed the business community about the situation. They had not been aware of the council's decisions. A task force has been formed to study the situation since the town is interested in increased revenue from tourism. There has to be a balance between increased revenue and the costs associated with those additional tourists. We will continue to monitor this story as well as similar ones. As the cruise industry continues to expand into new ports of call, many towns like Rockland, will be faced with similar decisions. So, for now, the Jewel of the Seas, and the 2,504 passengers she carries, will be stopping in the quaint coastal town of Rockland, Maine. You might want to plan a visit to this part of New England for the upcoming fall sailing season. CYCLONE MOVES OVER THE GULF OF MEXICO LATE TONIGHT AND SATURDAY. The two ships - Carnival's Destiny and Royal Caribbean's Grandeur of the Seas - have been rescheduled and will arrive in port on Sunday. Destiny will dock at the Outer Mole pier from 12:30 until 8 p.m. and the Grandeur will be at Pier B from 2 until 8 p.m.
We will continue to provide further updates if other developments occur. Since the U.S. Coast Guard closed the Port of Key West due to Tropical Storm Bonnie, Grandeur of the Seas was unable to make its scheduled port call there today. The ship is sailing directly to Cozumel, Mexico, where it will arrive on Saturday. No other Royal Caribbean International ship's itinerary is currently being affected by Tropical Storm Bonnie. Celebrity Cruises and Azamara Club Cruises are closely monitoring the path and progress of tropical depression #3 to ensure our guests enjoy safe and comfortable cruises, and to make certain our ships steer clear of the storm. The safety of our guests and crew members is always our foremost concern. At this time, no Celebrity Cruises or Azamara Club Cruises ship is being affected by tropical weather. We will continue to closely monitor weather conditions and will update this information if there are any changes. SPREAD OVER SOUTHWEST FLORIDA DURING THE NEXT FEW HOURS. WHERE THE CENTER MAKES LANDFALL ON THE NORTHERN GULF COAST. 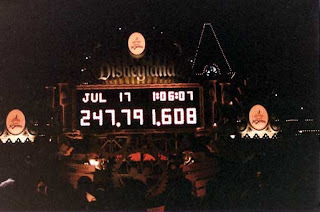 July 17, 1955 Walt Disney Welcomed the First Guests to Disneyland Park in California. Today we Celebrate the Dream that Still Continues. Twenty-five years ago, my husband, toddler son, and I had the privilege of attending a Birthday Party like no other party you could imagine. 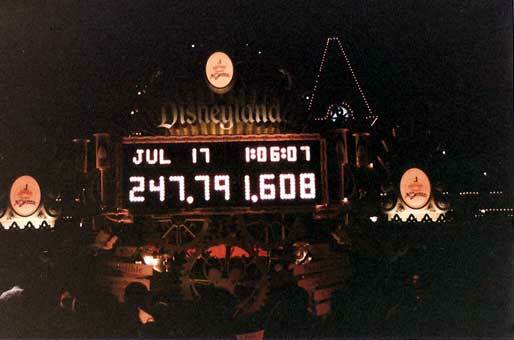 At the stroke of midnight, the gates to Disneyland opened for those who had tickets to the event. As you can see from the picture above, we entered the park around 1 AM. The Disney cast members lit the sky with a rainbow of light and hosted a party which included the Main Street Electrical Parade and other special treats. The park remained closed to the public until after breakfast. Can you imagine having Disneyland to yourself? The creator of Mickey Mouse and founder of the Disneyland® and Walt Disney World® Theme Parks was born in Chicago, Illinois, on December 5, 1901. His father, Elias Disney, was Irish-Canadian. His mother, Flora Call Disney, was of German-American descent. Walt was one of five children, four boys and a girl. Walt was a pioneer, innovator, and the possessor of one of the most fertile imaginations the world has ever known. 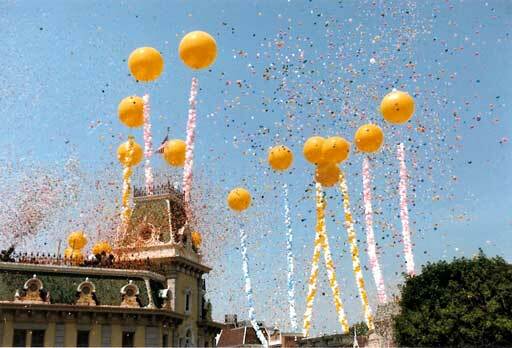 His legacy continues today as the Disney Imagineering Staff take dreams and turn them into reality. It is fitting that the next Disney Cruise Line ship is named Disney Dream. There are many theme parks across the land, but the Disney Theme Parks continue to be the most well run, family-oriented, entertainment venues of all time. 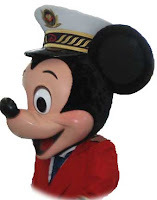 In the cruise industry, we refer to the experience onboard a Disney ship as the "Disney Difference". Mickey Mouse and all his friends and family are there to greet you as you step out of reality and into a dream come true. If you like the water parks on land, you'll love the water parks onboard the ship. I'm sure you've been to Disneyland or Disney World and rode on the Pirates in the Caribbean. On the ship, you can actually be part of a party hosted by your favorite Pirates. There's even fireworks that are shot from the deck of the ship. The Disney crew members know how to keep children entertained for hours, both at the theme parks and also on the ship. You'll not have to worry about your children being safe and having the time of their lives when you step aboard one of Disney Cruise Line's ships. I could go on forever about the Disney Difference, but I don't want to spoil all the surprises when you set sail yourself. Congratulations to the Walt Disney Company on achieving another milestone - the 55th Anniversary of bringing a little joy to all that "come to this happy place". Tropical storm Conson is now dissipating over Vietnam. At one point in time, it was a powerful Typhoon which caused extensive damage and loss of life in the Philippines and China. In the Philippines, at least 53 people were dead and at least 38 were missing. More than half of the main northern island of Luzon, which includes Manila, was without electricity, and authorities said it would take two to three days to restore power. Several dozen flights were canceled, and schools and many government offices closed. High winds felled trees and floods were knee-deep floods in some communities in the capital. Heavy rains, unrelated to the typhoon, have also wreaked havoc in China and Japan. More than 100 people are dead from flooding in China. The typhoon hit northern Vietnam and caused torrential rains on Saturday afternoon and evening, initial reports said. 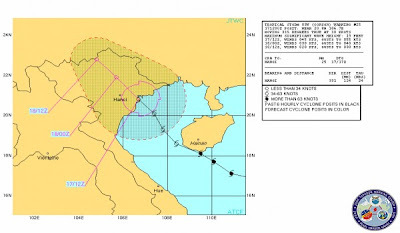 Strong winds from the typhoon swept out Hai Phong, Thai Binh and Nam Dinh in the afternoon, while Ha Tinh and Quang Binh saw downpours, up to 180 millimeters. A tropical storm in the West Pacific, when it intensifies, becomes a Typhoon. A typhoon is a tropical storm with sustained winds in excess of 119 km/h or approximately 74 mph. If the same storm were in the Atlantic, it would be called a hurricane. 171500Z POSITION NEAR 21.1N 106.4E. AT 171200Z IS 19 FEET. The forecast indicates that the storm should dissipate over the next 24 hours. Continue to monitor this blog for tropical weather reports throughout the year. The picture to the left was taken aboard Norwegian Epic during a pre-inaugural cruise. At first glance you might think this is the inside of a large bathroom. Is that a flat screen television in the bathroom? Well, I hate to disappoint you, but no, it's a sink inside the sleeping area of the cabin. Above the sink is the storage area for towels and toiletries. Norwegian Cruise Line (NCL) is known for innovations in their ship designs. Ten years ago the cruise line introduced Freestyle Dining and built the first ship, Norwegian Sun, designed to facilitate the new concept. Many cruise lines have since introduced similar alternative dining venues, but none have done so to the same scale as NCL. 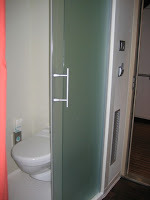 NCL's newest ship, Norwegian Epic, introduces what I'm calling "Freestyle Bathrooms". With Freestyle Dining, one can dine when you want and where you want. With "Freestyle Bathrooms" one guest can wash their face or shave while another one takes a shower while another one ... well, you know. All guests can get ready for their day at sea or in port at the same time. At first, the concept sounds appealing, especially for guests in triple and quad occupancy cabins. Married couples traveling together probably won't have an issue with privacy in the bathroom arrangement, but we're not certain guests traveling with friends will feel the same way. Even families with children might have issues with this freestyle design. 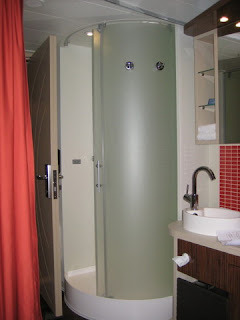 In a typical bathroom on other cruise ships, you would open the shower door and grab a towel from the rack inside the enclosure. Notice that the towel "rack" is a hook on the outside of the shower door on the Epic. 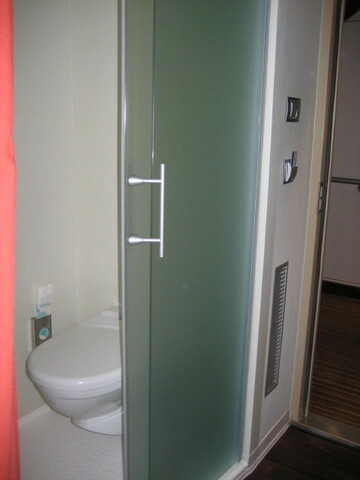 There is a privacy curtain that can be pulled to hide you from others in the cabin however if someone is using the toilet, you'll want to time your exit from the shower properly. 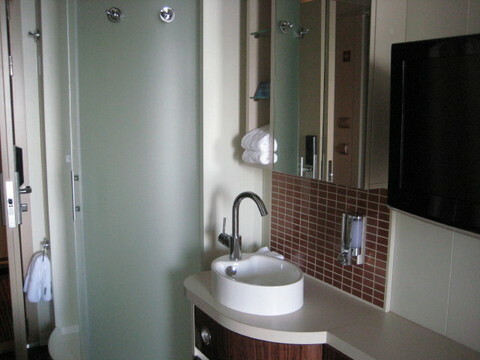 The bathroom area is the first thing you'll see as you enter the cabin. Besides the privacy issues discussed above, there are other issues with this design. The sink basin is very shallow and guests have reported that water splashes onto the cabin floor every time they use the sink. Some guests report that they eventually find out how to control the water flow so that they don't drench the floor, but that usually occurs after a day or so. What happens when you take a hot shower at home? Steam billows out from the shower when you open the door. The same thing happens on a ship too. In a typical ship bathroom, that isn't an issue since you are still within a confined room. On the Epic, you are in the main cabin area and sensors which keep you safe from fire could be tripped. So much for privacy as you hear a knock on the door as a ship's crew member makes sure there isn't a problem. Steam rises as you know, so the cabin ceiling will now become wet and unless properly cleaned on a regular basis, could lead to a build up of mold in the cabin area. Norwegian Cruise Line has already announced that the sink situation will be reviewed and it may be necessary to replace them with a different model that won't splash onto the floor. It is common for new ships to have some "kinks" that need to be ironed out. In many cases, the problems don't surface until the first passengers set sail on a pre-inaugural cruise. We are certain there will be changes on the Epic, but in the meantime, guests need to be aware of the current situation so that they can plan accordingly. Getting to the bathroom at night could become a challenge in some of the cabins since it is necessary to get past the sleeper sofa or the main bed, depending on the room's arrangement. The wavy wall design may impact the amount of room for navigation in some cabins. Looking back ten years, there were "kinks" in Freestyle Dining which have since been ironed out. In fact, onboard the Epic there are 21 dining options, some of which are first time offerings. So, to be fair, we need to give "Freestyle Bathrooms" a chance. Perhaps the benefits will outweigh the drawbacks - time will tell. One thing is for certain, the Norwegian Epic's design is a conversation starter. Right now the bathrooms are definitely the talk of the town. We'll keep an eye on this story as time goes on to see what changes are made. 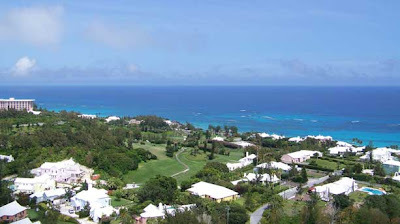 NOW EVEN MORE BERMUDA ITINERARIES! From April to November 2011, Carnival Cruise Lines will be offering 16 departures to the island from Baltimore, Norfolk, New York - and for the first time, historic Charleston! 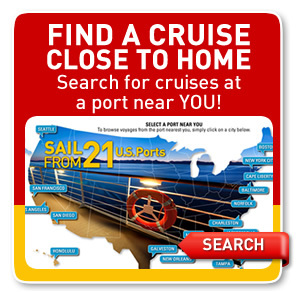 Baltimore (7-day cruises on the Carnival Pride) – April 10 and 17, September 18, October 2 and November 6. New York (7- and 8-day departures on the Carnival Miracle) – April 14 and 21, and September 11 and 27. Norfolk (6-day sailing on the Carnival Glory) – October 16. Charleston (6-day voyages on the Carnival Fantasy) – April 23, May 19, June 16, August 25, September 15 and October 6. 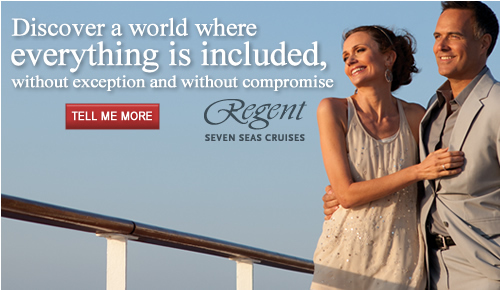 Reservations are currently open for these 2011 Bermuda sailings. All of the Bermuda voyages will dock at King's Wharf. Guests on 6-day voyages will be able to spend two-day calls in King's Wharf; those on the 7- and 8-day cruises spend three action-packed days in Bermuda. The people of Bermuda are very friendly and helpful. There are plenty of activities for the entire family in Bermuda. It is very easy to get around Bermuda by bus, taxi, and ferry. King's Wharf is the perfect location for starting your day's exploration. Hamilton is a short ferry ride away, so you are not limited to one area. Do you like a little mystery in your life? WHY NOT BOOK A MYSTERY GROUP! Plan it today. Whodunit creates a live mystery aboard the ship that everyone in the group will become a part of as well as try and solve! 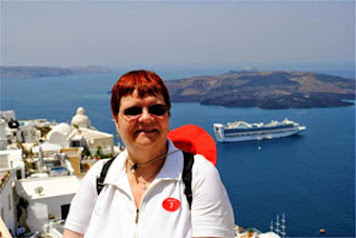 There are times when the guests are following the mystery and other times when they are free to enjoy the cruise. We don’t want them to have to look over their shoulders for the entire cruise! On a 7 night sailing the show takes place for the first four nights. On a three night sailing it will last the whole cruise. The show starts with a flyer that goes out to the guests to get you into the swing of things and let you know the theme of that sailing’s show. When you board you are given a role to play. Not to worry. If you are on the shy side you can sit back and watch it all unfold. If not, you will use your character to find out as much as you can because the actors are mixing among you! We do an event before dinner then at late seating every night. BIG CLUE...everyone must dine at late seating! Nothing happens when you are at port so you won’t miss any important clues. There are notes slid under your cabin door…and mysterious phone calls made to your cabin. All kinds of wild and suspicious fun! Eventually a crime will occur, a detective will come on the scene and hopefully with help from the guests…solve the crime! We end with a hosted cocktail party where the fabulous supersleuth is announced and the prizes are given away! Whodunit’s wild shows are comedies! So, even if you do not want to solve the crime you can sit back and enjoy the show! But beware... guests have been known to... DIE OF LAUGHTER! Add the excitement of a Whodunit Mystery to your cruise! Limited availability exists for this unique onboard experience. They're waiting for you onboard ... don't make them wait too long. Get a group of your friends and family together and get ready for the time of your life. Norwegian Epic set sail today on it's first Eastern Caribbean voyage after successfully crossing the Atlantic and completing several short inaugural cruises. On July 2nd, Reba McEntire christened the new ship in New York before inaugural events continued, including a live broadcast from the ship during 4th of July festivities in conjunction with Macy's 34th Annual Fireworks display. 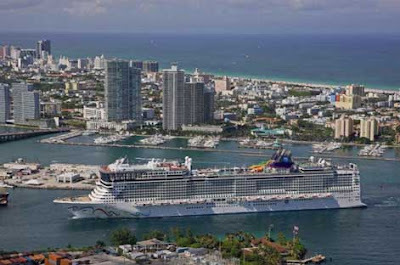 Norwegian Epic is sailing alternating Eastern and Western Caribbean itineraries every Saturday from it's home port in Miami where it will remain through April 2011. Its first voyage will be to the Eastern Caribbean, with stops in St. Thomas, St. Maarten and Nassau, Bahamas. In the Western Caribbean, Norwegian Epic will visit Cozumel, Costa Maya and Roatan, Honduras. World-class entertainment is Norwegian Epic’s hallmark. For the first time at sea, Blue Man Group performs their exhilarating fusion of comedy, theatrics and paint, exclusively on Norwegian Epic. In the only “big top” at sea, Cirque Dreams and Dinner presents a one-of-a-kind interactive theatrical dining experience with music, mayhem and acrobatic imagination. Legends in Concert, the original and world’s greatest live tribute show, is featured for the first time at sea in more than a decade on Norwegian Epic, along with The Second City improvisational comedy and Howl at the Moon, the world’s greatest rock ‘n roll dueling piano show that encourages audience participation. New York-based Slam Allen Band rocks the house with down-home blues in Fat Cats Jazz and Blues club. The 4,100-passenger Norwegian Epic incorporates many innovations including several new types of accommodations – the curved New Wave staterooms; the largest Villas suite complex at sea, comprising 60 suites and villas on two private decks at the top of the ship; and spa and family-friendly accommodations. Kids will have a blast with Nickelodeon at Sea™ offering Nickelodeon-themed family entertainment and programming including: character meet and greets; interactive game shows; and more. Mahwey Productions, in conjunction with Royal Caribbean offers CRUISING WITH THE KING which provides guests with a full King experience onboard the ship, beginning with a Welcome Aboard Tribute concert followed by a Meet and Greet and photo op with your tribute artists. Other events include Sing Like a King at Talent Night and throughout the cruise you will be guests at tribute performances featuring songs from the many decades of the King's career. Re-live the excitement of the King in Vegas, music from the movies, gospel songs and more. 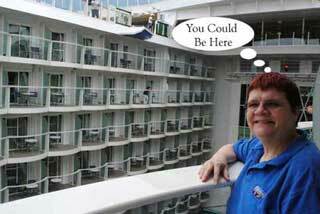 Enjoy the King trivia for fun and prizes, and special King “sightings” around the ship. Book the stateroom and dining of your choice and add on the Cruising with The King entertainment charge of $150 per person to participate in this themed event. 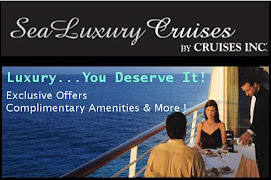 Just be sure to mention the add on entertainment fee when booking your cruise. Cancellation Policy: You will have until final payment due date to receive a full refund. After that, there is NO REFUND. The entertainment fee is non-refundable. Remember and Re-Live the Life and Music of the King while sailing one of Royal Caribbean's ships. Norwegian Epic, the brand new 153,000 ton addition to Norwegian Cruise Line's fleet of Freestyle ships, arrived in Miami as a fire boat saluted the new vessel. The ship introduces a number of industry firsts, including an ice bar, cabins for solo travelers and performances by Howl at the Moon, Blue Man Group and others. The entertainment is definitely among the best in the industry. For Miami, Florida, the Epic represents the first new megaliner since 2007 to call the Port of Miami home. The economy of Miami will get a boost with an anticipated 300,000 passengers sailing on the new ship which means approximately 90,000 passengers will arrive through Miami International Airport annually. The ship will support 1,000 jobs throughout the state and provide $3.5 million in annual revenues through fees according to estimates provided by the Port of Miami. "We are bringing our best ship into Miami because we're proud of where we live and work," said Kevin Sheehan, CEO of Miami-based NCL Corp. 'We believe that the people of Miami deserve to have the best ship in the market there." Norwegian Cruise Line had originally planned for two ships to be built by STX Europe but due to cost overruns, they backed out of their deal. Therefore, Epic will be one of a kind. Be among the first to sail on this new engineering wonder. 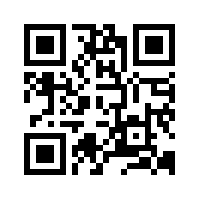 Check out the pictures and videos by clicking the link above. 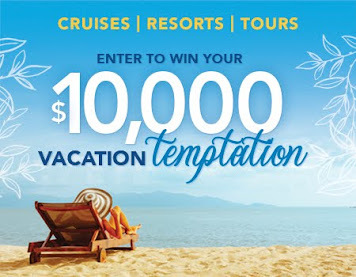 Take advantage of Norwegian Epic's Launch Bonus offer. Norwegian Cruise Line's new ship, Norwegian EPIC, arrived in New York City in time for this year's 4th of July celebration from New York Harbour. The largest ship in Norwegian Cruise Line's fleet was christened by Reba McEntire on July 2nd. The largest fireworks display in America will light up the New York skyline tonight starting at 9 PM Eastern. The skies over the Hudson River will be ablaze with 40,000 dazzling displays of color as the nation's largest fireworks show marks the July Fourth holiday in New York. Some of the effects will shoot 1,000 feet into the air so that they can be seen above Manhattan's skyscrapers. Tonight's show will be broadcast live from the Norwegian Epic cruise ship and will feature performances by teen sensation Justin Bieber and the Mormon Tabernacle Choir. As always, a special musical score,this year's entitled "American Harmony", will help set the stage for this moving pyrotechnic display. For more information about the event, see Macy's website. 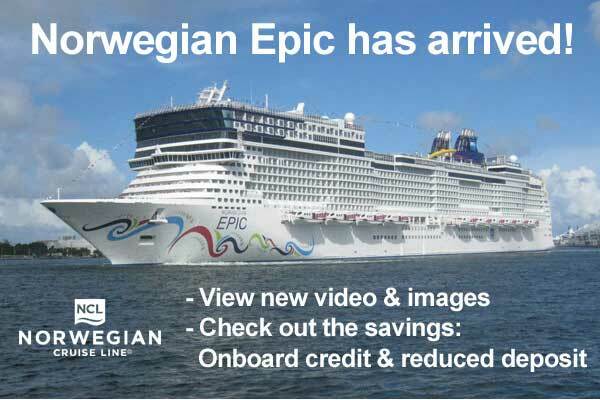 For more information about Norwegian Epic, see Norwegian Epic Delivered to NCL. Norwegian Epic, Norwegian Cruise Line's largest and most innovative Freestyle Cruising ship to date, was officially christened on July 2 by its godmother country music superstar Reba McEntire. The entertainment extravaganza was hosted by comedian and Curb Your Enthusiasm star Jeff Garlin and included performances by the ship's world-class entertainers on board, including Blue Man Group; Cirque Dreams™ & Dinner; Legends in Concert performers Madonna, Elvis and Tina Turner; Second City® Comedy Troupe; Howl at the Moon Dueling Pianos; among others. The hour-long event was simulcast in venues throughout the ship to allow maximum viewing opportunities and culminated with Ms. McEntire cracking the bottle to christen the ship. The ship, which was docked at Pier 88 at the Manhattan Cruise Terminal, is now sailing on a two-day preview cruise before returning to the pier the morning of July 4th to host the Macy’s 4th of July Fireworks® Spectacular. You'll notice from the photo that Reba wasn't outside and she wasn't holding an actual bottle of champagne. Reba pushed a button on the screen inside and then they cut away to show the bottle being released to hit the ship. Wine poured upon the deck before a long voyage represents a libation to the gods which will bring good luck. "Christening" a ship by breaking a bottle of champagne across her bow at the time of launching arose from this practice. Read more about Nautical Superstitions & Legends. Although we weren't personally able to attend the Norwegian Epic's inaugural events in New York, we did have other representatives onboard from our agency, so we'll bring you more information from those that have sailed on the largest ship in Norwegian's fleet in future posts. We'll also be hosting our National Conference onboard the Norwegian Epic in October, so we'll have more to report throughout the year.